Party for Fun or Celebrate? Perhaps you want to host or throw a party for a small group of family and friends, then perhaps arrange at an Auckland City Hotel. Consider the Sky City Hotel or one of many accommodation venues around the City, or near the Waterfront at the Viaduct basin and Restaurant precinct. Maybe include harbor cruises, leisurely yachting, or fishing charters for your group. Or a hotel party adjacent to the Vector Arena for additional event entertainment if available. 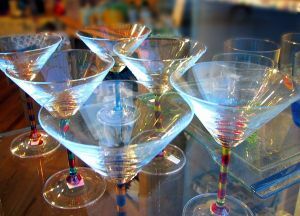 Image of beverage glasses by fjklein at SXC. * Select and contact a suitable Hotel that can provide the type of party or celebration that suits your idea or theme. This might be for a birthday, get together, celebration, official function, promotion, wedding anniversary or other themed gathering. * Confirmation - with management that they do provide to your satisfaction, and if you can also provide any of your own requirements or functions. This might include own food, beverages, decoration (e.g. for cultural or religious type themes), number of guests, music band and other supplements. The aim is to query everything (that comes to mind) and to clarify or confirm that suits you. I think responsibility, openness (to management) and age might be key features, perhaps along with a 'small number" of guests for a party. For example requirements for hosting a 21st, along with the host (e.g. age), might be different than for a corporate function with senior or long serving staff. Who knows? Find out by contacting, along with parental or authoritative guidance if necessary. Though their are NZ event management companies, gourmet gift suppliers and NZ party suppliers for larger events should you want to scale up. Or maybe hotels can easily arrange up sized events. * Visitation - Visit the hotel and view surrounding internal and external, to assess if sizable and suitable. This includes furniture, possibility of adjacent rooms, seating, suitable outside views, safety, banquet rooms, outside seating, parking, amenities, service, and other aspects that might come to mind when present at the Hotel. So become familiar with the establishment, any plans, and features. Perhaps discuss pricing and again confirmation if discussed previously as above. Hence you can convey to your group what to expect in terms of cost and amenities, and locational features. * Accommodation requirements - Economizing on cost per head which includes allowable number of guests per room, whether if a actual physical bed needs to be utilized strictly as a single or double only. I have had extended family members of mine bunked up in a double room with only two real beds, though that was at a regional mid priced Motel. * Guests needs - Check with staff if they provide particular meal menus and needs(e.g. vegetarian, disability requirements) for any of your group. Or if additional non staying guests can be allowed, and any time restriction for entering, leaving, and ending the party. This might include allowed or restricted zonal use of any of the amenities, parking, and washrooms within the immediate vicinity of the event or party. * Guest entry - Hotel staff needs to be informed of your guests as they arrive, hence a procedure may be required to welcome them formally (if arriving at different times for example). They may need directing to the appropriate venue or hotel rooms. * Establish cost - Discuss and establish before the function, and pay at least a deposit. Or maybe if their are payment plans or options if required. Of course you can get others to contribute, e.g. family and friends. * Again, if not previously, remind your guests, family friends, or group of arrival time, function start time, suitable parking areas, hotel venue, and any procedure when arriving. Perhaps provide phone numbers, and refer them to visit online, e.g. Google Maps for Auckland City, or the Hotel Website as a point of reference and familiarity. Perhaps get to know public parking or transport options within the City, including car parks, buses, and trains to inform your guests. Maybe get to know Auckland City CBD or local main streets, such as Queen Street. * Guest or gift cards and name tags * balloon direction signs * Suitable lighting * Suitable music selection for all * dedicated present or gift stand * decor back grounds: decoration, banner stands, themed accents, props, mural, posters, etc * guest seating placement. Perhaps visit a planner guide or online party check list generated tool (e.g. for kids birthdays, bridal shower) to get more ideas and insights that you may not have thought off and specifically planned for. * Then enjoy on the day for yourself and as a host, by being a bit in charge, mixing with your guests or group and hotel staff if required. By being involved in the planning process, earlier visitation, and then mixing within your group should hopefully evolve into a enjoyable party to remember not only for you, but also invited guests.